This entry is dedicated to customization of “Project Entities” – i.e. data objects in QC, with the examples from “Defects” module (or “Issues”, as I renamed it). Project Customization view (1) enlists components on the left side (2) with the component details view in the center panel. Project Lists (2a) is a cross-component collection: whenever an enumeration type is used, the lists and their elements need to be declared as a standalone entity. 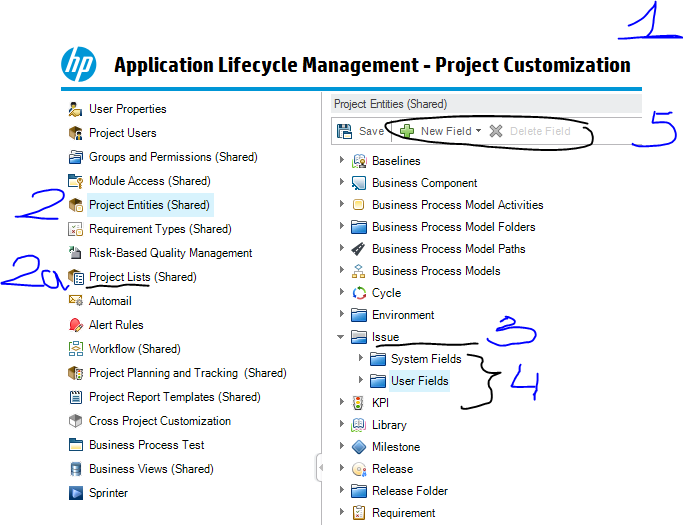 For Issues (3), QC has System Fields and User Fields categories (4). In fact, it’s all issue properties. System Fields are hard-coded in QC database and cannot be removed but are still customizable to some extent. We cannot add a new System Field either. 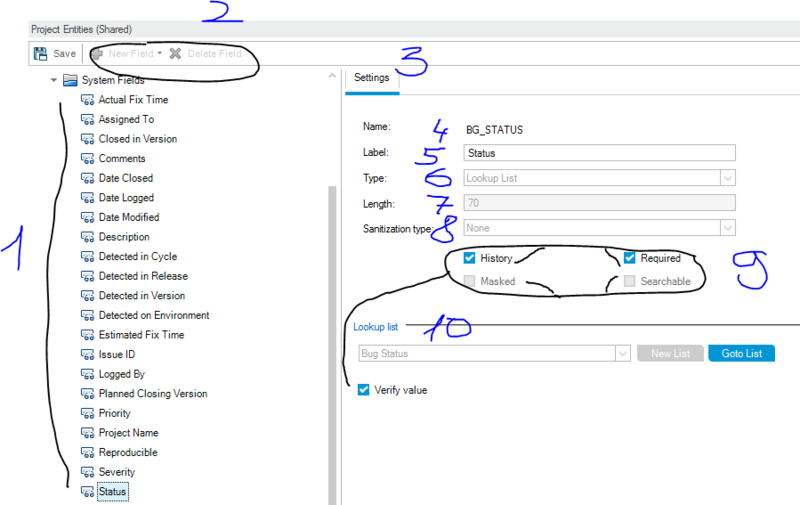 User Fields category (4) enables adding /removing new fields (5) and custom setting of their properties. There’s a fixed list of System Fields (1) . Adding or removing (2) new System Fields is not allowed. Settings (3), however, are a bit customizable. Name (4) is hard-coded (“BG_STATUS” in the example below). Label (5) is customizable, and that’s what is displayed in the UI. Type (6) is hard-coded for System Fields. Length (7) is hard-coded for System Fields. Sanitization (8) is hard-coded for System Fields. Flags (9) are partially customizable for System Fields. Lookup list (10) for System Fields is pre-defined; you can add/remove your custom elements but cannot modify/remove pre-defined items. Verify Value flag turns on automatic verification of user input. Make sure to turn it on for List type. 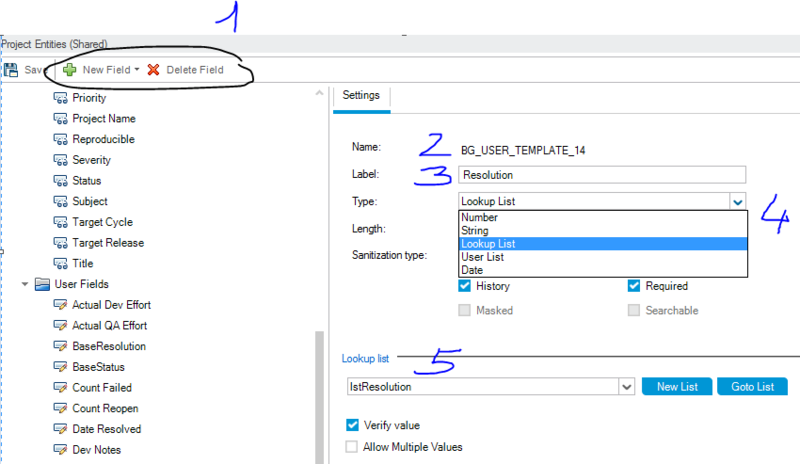 User Fields category allows adding/removing (1) and customizing settings of the fields. Name (2) is auto-generated and hard-coded, so again – you may need to have a translation table for yourself to map “BG_..” type names to meaningful labels (3). There are four data types (4). And you can declare your custom lists (5). Severity and Priority have a reversed (comparing to the industry common) order. Severity 1 is a ‘cosmetic’ problem by default. It seems HP ALM does not consistently handle timing out for when you’re in customization mode. So make sure to save changes to prevent their loss or corruption during time out. I’ve also experienced a few crashes upon saving of the customization (at least, in version 12.2) which led to unknown state – some changes were saved, some were not. So I applied changes one by one in a careful sequence, saving and logging out to make sure that the changes are “committed” to the server. It takes a few minutes before admin changes become effective. So when customizing and testing the changes you may encounter that “it didn’t work” – wait 3-5 minutes and retry before digging for mistake. 2 responses to "Project Entities (HP ALM/QC)"